"The Coptic Church is an ancient pride of the Egyptian nation that deserves a modern glory like its old ones.” This is how Taha Hussein, a towering figure in modern Arab literature, described in his book "The Future of Egyptian Culture" the project to establish a new headquarters for the Coptic Church. 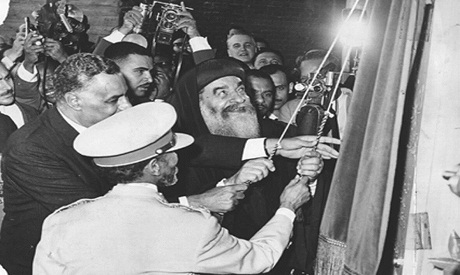 This week, 50 years have passed since the inauguration of the Coptic Church headquarters in Cairo’s Abbaseya district, opened by late Egyptian President Gamal Abdel Nasser. On 25 June 1968, Nasser and Ethiopia’s Emperor Helasilasy attended the historic inauguration along with then Coptic Orthodox Pope Kirollos (Cyrel) VI. The compound in Cairo's Abbaseya district is now the papal headquarters since Patriarch Pope Shenouda III decided to reside there in 1971, followed by his successor, the current Pope Tawadros II in 2013. Over many years, the Coptic Church of Egypt has represented a protective fortress for Egypt's Christians while opposing any attempts to harm Egypt’s national unity. In 1853, the ruling Ottoman sultan issued a decree to establish a Coptic Church in Egypt in Cairo’s Azbakeya district on the recommendation of an Ottoman princess who was hosted by a Coptic Christian in Egypt on her way to pilgrimage in Hegaz. This first headquarters of the Coptic Church remained so until the Abbaseya headquarters were opened in 1968. 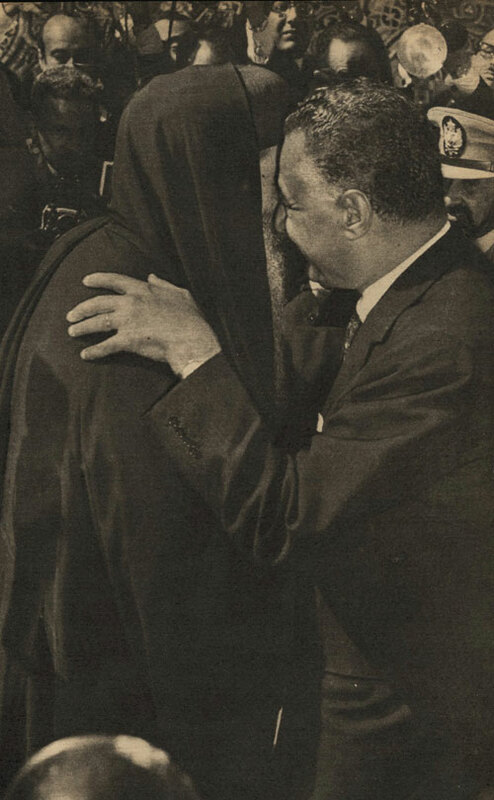 Pope Kirollos VI, who enjoyed good personal relations with President Nasser, was very enthusiastic about establishing a new headquarters for the Coptic Church, but was concerned about a lack of resources for such a project amid the socialist policies of the Nasser era. 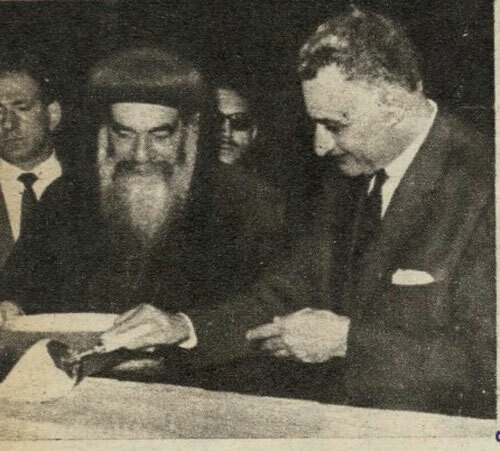 Yet when Kirollos suggested to President Nasser the building a new headquarters, Nasser approved the project immediately, as he understood the significance of the Copts of Egypt to the social fabric of the country, as well as the role and stance of the Egyptian Coptic Church across its history. St Mark's Coptic Orthodox Cathedral was built and opened in 1968, with Gamal Abdel Nasser attending, 1,900 years after the death of St Mark, the first promoter of Christianity in Egypt, and whom the papal seat in the country is named after. 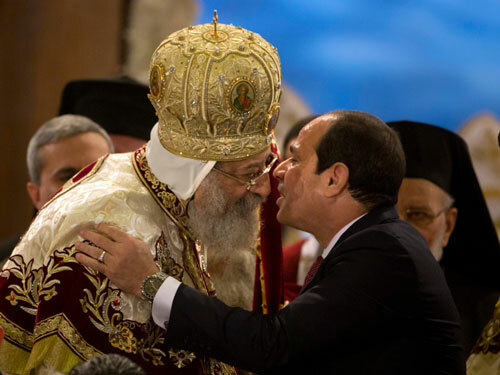 President Abdel-Fattah El-Sisi congratulating Coptic Pope Tawadros II Easter.